Fresh Force-y fun rrowrs, Chewbacca-style, in Anaheim. AAAAAARRRLLL: Okay, so clearly our Wookiee needs some brushing up, but we wanted to express what "Star Wars" fans must be feeling upon hearing that a new experience is headed for Disneyland Resort starting on Monday, Nov. 16. 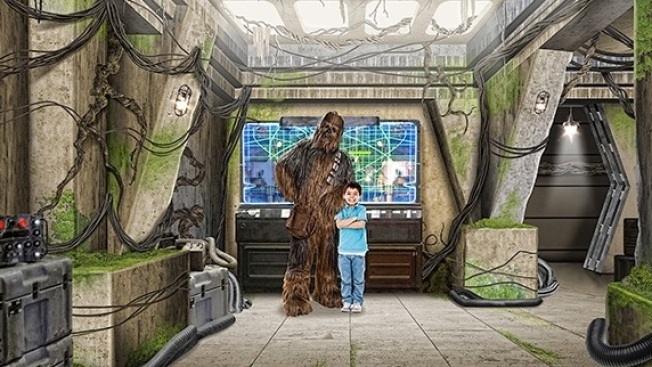 Nope, this is not the mega 14-acre themed land area, with its rides and experiences and cantina -- that's a few years away, for sure, and no amount of wishing can bring it into being ahead of that time (Yoda might be able to, being very powerful, but, you know, he's always quite busy). But The Happiest Place on Earth will be pulling a bit of the cosmos down to this planet, for a time, far ahead of the opening of the new "Star Wars" area, during its special Season of the Force. SEASON OF THE FORCE... features a few fun new things, including a "Star Wars" Launch Bay, where guests to the theme park can "visit with favorite 'Star Wars' characters" as well as eye special exhibits and nab "peeks at the upcoming 'Star Wars: The Force Awakens.'" Something a little fresh and Force-filled will alight upon the popular Jedi Training area in Tomorrowland come December, with "new characters and a new villain from the popular Disney XD series, 'Star Wars Rebels.'" And Space Mountain will get a temporary redo, with "Star Wars" theming, so polish your Xwing for Hyperspace Mountain. OF COURSE, Star Tours, found at the entrance to Tomorrowland, is still doing brisk business, delivering guests into the furthest stretches of the galaxy every few minutes. The ride, which features a few shiny C-3PO cameos, is a classic topper to a day spent doing some new "Star Wars"-related things around the futuristic land. But will you wear your Han Solo vest? Maybe you should: The Anaheim park is about to get galactic during Season of the Force, a pre-cursor to the brand-new land that's one day to come.